An early start ready for a long day. Catch the bus into the park, luckily the rest of the bus are heading off in a different direction. Zig zag up Senda de los Cazadores, quickly need to strip off most of the layers we’d wrapped ourselves in in the cold morning. Enjoy the view from the mirador and then along the Faja de Pelay with great views all the way. Arrive at the Circo de Soaso where we rejoin the crowds, but it’s nice to relax enjoy lunch in the sunshine besides the Cascada de Cola de Cabello. And i must have been relaxed because a lizard walked right on over me as I was laying down. A sign directing to the Refugio de Goriz por clavijas intrigues me and after watching several people make their way up a seemingly un-passable (from a distance) cliff face we decide to go and investigate. Turns out they’re sections where pegs and chains allow you to ‘climb’ the rock. Of course we had to go up. At the top it seemed sensible to do a figure of 8 and return to waterfall via the ‘sendero’ path. 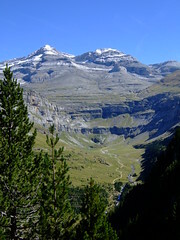 From there it was an easy walk back down the valley back to La Pradera de Ordesa, with plenty of ‘cascadas’ to see along the way.